The 20-year-old Silk Alley, or Xiushuijie, a bustling outdoor market in Beijing, was closed Wednesday for safety reasons. The government had ordered more than 400 vendors in the 500-meter-long, three-meter-wide pedestrian street to move out of the market before Monday. The government ordered the market to close because it does not have proper firefighting facilities and lacks a land certificate. 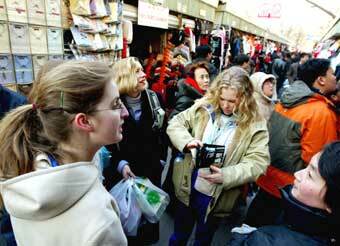 An estimated 80,000 shoppers went to the market each day after the relocation notice was issued to vendors last month. The traders have been selling their goods at prices much lower than usual. A purse priced at 300 yuan (US$36) was sold for a meager 50 yuan Tuesday. Speaking in fluent English, Mandarin Chinese and Russian, vendors told customers they were offering the biggest discounts. In the afternoon, security guards tried to prevent people from entering the market, already crammed with customers. Many went there merely to see it for the last time. Construction of a five-story building, known as the New Silk Alley Market, is nearly completed next door, but its opening has been postponed until the end of the month.